Every year, manufacturers and suppliers have their products transported to trade shows across the Continental United States and Canada for exposition. This is a critical marketing component for most businesses as they use the opportunity to sell new product lines and display innovative technology. At Great Western, Trade Show and Expo shipping is taken to the highest levels: a no-nonsense approach with a sincere sense of urgency. We understand the pressures and timelines the professional exhibitor and support staff faces. 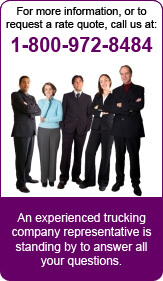 We can even rescue delayed, misrouted or stranded shipments from other shipping and trucking services. Great Western uses mostly 53 foot Air Ride Trailers to transport your trade show shipments into and out of trade show venues. We assure that only qualified drivers are used – those who know and understand the importance of on-time delivery and proper handling. If your volume does not warrant a Full Truckload (FTL), and needs only a portion of the space in a trailer, Less-than-Truckload (LTL) service may meet your needs. This will provide you with all the luxuries of shipping by dedicated trailer, but you will only pay for the space that you use. In addition, dock-to-dock service assures that your cargo is not cross-docked in transit, giving it less exposure to potential damages. Moreover, transit times are significantly less because cross-country service is usually available in as few as 4 days. We at Great Western want to make your next tradeshow a success, and understand that you may have questions. Our experienced staff is very knowledgeable in this area, and we ask that you call us, as we know that each company is unique and therefore the solution to your particular needs will also have to be unique. Great Western makes sure your trade show materials arrive just as you envisioned.